This time of year, at least once a week, I find myself recommending salt socks to patients (either for themselves or for their children.) 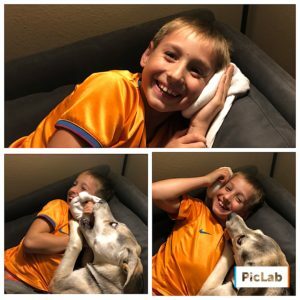 AND everyone comes back to say, “DOC, I can’t believe how well that worked!” SO, since… ’tis the season of colds, flus and EAR ACHES… I thought it was about time to re-post this for all to enjoy! Get adjusted – misalignments in the upper cervical area (the upper neck) have been related to chronic ear infections in children. Do NOT lower the fever – the body raises its temperature to kill the bacteria. If we lower that temperature we are interfering with the body’s natural defense mechanism and could prolong the infection. 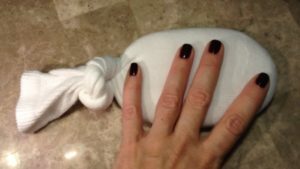 Use a SALT SOCK for relief while you give the body time to heal. 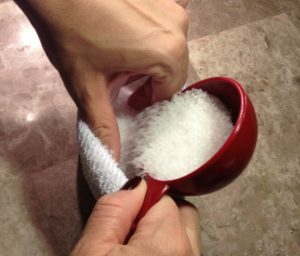 Basically, a Salt Sock is just a white cotton sock filled with Coarse Sea Salt that you heat up and place on the affected ear for relief. Scientifically I could speak about the hygroscopic nature of salt, the healing properties of the minerals in the sea salt, or how the salt retains the heat so well creating a shift in the pressure within the ear… but its so much more fun to just say its MAGIC!!! Who couldn’t use a little more magic in their life – especially when their baby is suffering with an ear ache. 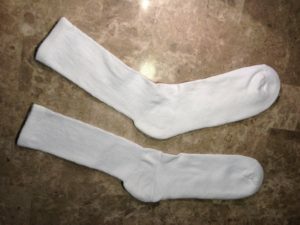 You will need a clean – ALL WHITE sock. Do not… I repeat DO NOT use colored socks, or socks with a colored toe section or colored line in the toe area. There is something in the colored threads/material that is flammable and will melt when you heat the sock. Do not risk it!!! Next you will need about 1 – 1.5 cups of Coarse Sea Salt. It should be coarse, otherwise it will seep out of the sock… and it has to be sea salt – regular table salt is not the same. It should be about the size of your hand. Cover your ear and the area behind your jaw bone with the sock and relax for a while. You will be amazed by the relief. 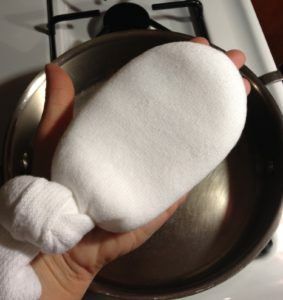 You can reuse the salt sock for a long time, though it will discolor after a while. Replace with a new one when it gets too old, dirty or worn. 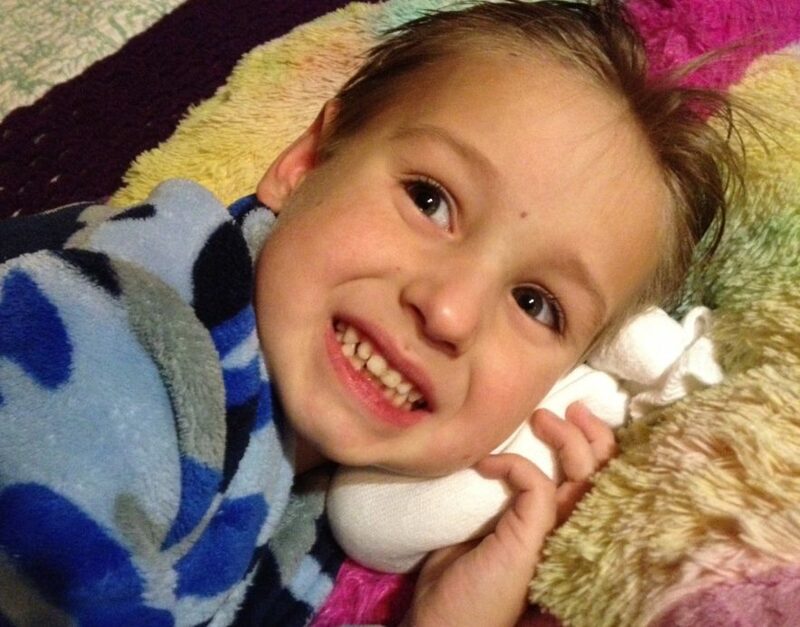 If you or your child continues to suffer with chronic ear infections, contact us. We can help! Chiropractic care and proper nutrition can put an end to chronic ear infections and make mom and child SUPER HAPPY!!!! NOTE ABOUT MICROWAVES: be very careful if you are going to heat it in a microwave – the salt will heat much FASTER and UNEVENLY and will take a toll on the integrity of the sock. I do not use a microwave so I can’t give specific instructions, other than to say colored socks and repeated heating of the same sock in the microwave can lead to an increased chance of the salt melting or the sock catching fire. Use a microwave at your own risk and be careful and heat in 5 second increments, shaking up the salt as you go until it is the desired temperature. I try to dedicate some time on a monthly basis to respond to pending questions and comments on my blog posts, but may not be able to review these comments right away. If you are experiencing a pressing health issue that requires attention please contact our office by phone to make an appointment or contact your health care professional. 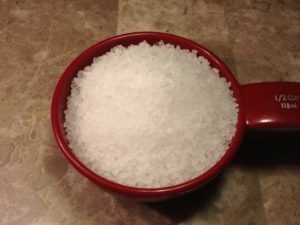 The use of a salt sock or information in this post or its “comments” section does not serve to diagnose or treat any medical condition, and in no circumstance should replace medical care and supervision. Most ear infections, in otherwise healthy children and adults, will clear up on their own without medical treatment. However, in an infant, child or adult with lowered immunity they can progress into a severe infection or contribute to other secondary opportunistic infections. 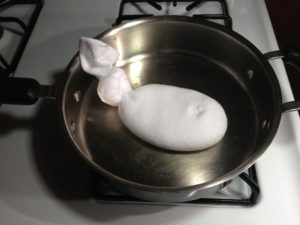 A salt sock may alleviate the pain associated with ear infections naturally and will complement traditional medical treatment and natural remedies alike.